Maria Livanos Cattaui has served on NBR’s Board of Directors since 2005. 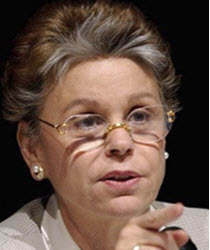 Mrs. Cattaui was Secretary General of the International Chamber of Commerce from July 1996 to June 2005. She has championed the role of world business in the global economy. She has been instrumental in establishing a global partnership between business and the United Nations, leading to greater business input in UN economic activities. Mrs. Cattaui worked with the World Economic Forum in Geneva from 1977 to 1996, where she became Managing Director, responsible for the celebrated annual meeting in Davos and building the public awareness it enjoys today. She is Vice Chairman of the International Crisis Group (Brussels), and holds board and advisory board memberships on the EastWest Institute (New York), the Institute of International Education (New York), the National Bureau of Asian Research (NBR), the International Youth Foundation (Baltimore), the Schulich School of Business at York University (Toronto), and the Elliott School of International Affairs at George Washington University (Washington, D.C.). Mrs. Cattaui, who is of Swiss nationality and Greek origin, was educated in the United States. She is an honors graduate of Harvard University. She holds an honorary doctor of laws degree from York University, Toronto.